Attempting to identify what makes certain films into instant classics is never easy, and no matter how hard one tries, it is near impossible to second-guess how people would react to a movie, especially in these days of instant social media gratification and throwaway commentary. In the case of Call Me By Your Name, it is frankly hard to see how anyone could possibly find fault with this genuinely stunning production. Adapted by Luca Guadagnino from Andre Aciman’s 2007 novel of the same name, the film offers one of the most beautifully told stories of the last decade. With a masterful score and some genuinely impressive direction techniques, Call Me By Your Name manages to immerse its audience in its gently melancholic world from the get go, and when it’s over you’ll find wishing you could go back and watch to all over again. It’s the summer of 1983 and 17 year old Elio (Timothée Chalamet) is spending the summer with his parents at their holiday home in rural Italy. Fluent in Italian, French and English, Elio has grown up in an envirement where all three language are spoken with beautiful ease by his Italian-American academic father (Michael Stuhlbarg) and French mother (Amira Casar). In between swimming in the river, reading the classics and occasionally flirting with the beautiful Marzia (Esther Garrel), Elio feels that his life is somewhat missing something. However, when cocksure student Oliver (Armie Hammer) is invited by the family to spend the summer at their home, the teenager’s life is turned upside overnight. Several years older than Elio, Oliver at first refuses the teenager’s advances, but soon neither of them can ignore the attraction they have for each other. Guadagnino creates a world which lures you in with an ambitious premise, and rather refreshingly delivers on all accounts. Not one shot or one syllable uttered by his characters is left to chance, and not one minute is wasted on superfluous padding. Slowly you will find yourself increasingly attached to these characters and to the world they inhabit, and when the end comes you are simply unable to tear yourself away from the screen. The director’s ability to make even the most mundane of tasks look as enchanting as the story it tells, goes a long way into showing just how accomplished he is. And by cleverly delaying the gratification of finally bringing the couple together, Guadagnino cleverly allows the audience to be fully engaged with the story and eventually rooting for his protagonists. With every furtive glance and gentle ribbing, the lovers are slowly brought together to our delight, even if it is at the expense of the young women who have fallen for them. Hammer is perfect as Oliver, he is handsome, arrogant and above all just utterly mesmerising. He is the tall beautiful stranger of any teenage girl or boy’s dreams. Unburdened by earthly worries and nonchalant to the point of irritation, Hammer manages to convey his character’s innermost feelings in just one look or brush of the hair. Chalamet’s turn as Elio is rather impressive for someone so young, especially considering that he is in almost every scene of the film. He exudes youthful buoyancy and joie de vivre and while Elio’s at times know-all demeanor could have come across as a little irritating in the someone else’s hands, Chalamet’s expertly judged performance manages to charm you no matter what. 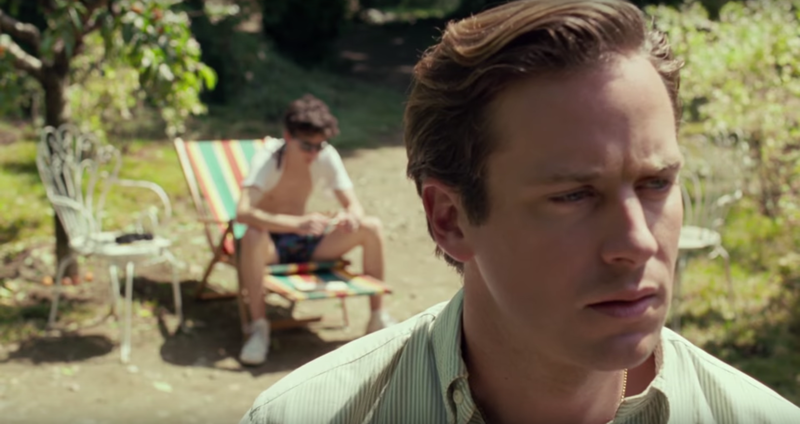 Call Me By Your Name is an enchanting tale of love and loss, but it is also an unapologetically sensual story, one which allows each and everyone of us to be reconciled with our inner teenager and our early crushes and disappointments. Guadagnino does a fantastic job in igniting in all of us a memory of what it was like to be young once. A genuine masterpiece.